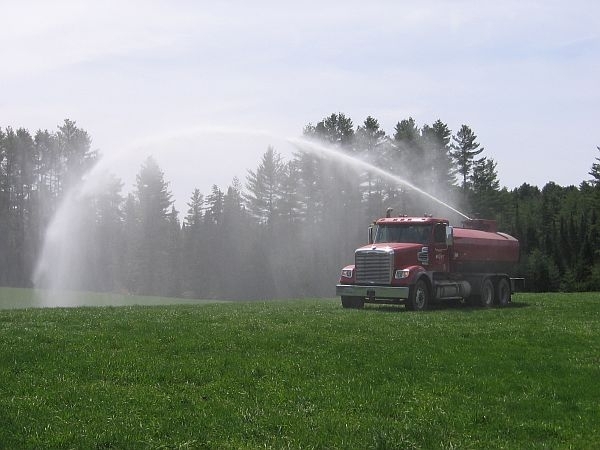 A big red tank truck with a spray nozzle on top pulls into a hay field in Marshfield. The nozzle swivels slowly like a giant sprinkler, and 4,000 gallons of waste water arc over the green field. Marcel Gravel of the Cabot Co-op explains that the state is evaluating this field as a spray site, so the full acreage can’t yet be used. "This is a test field. We can only do a certain portion," he says. The state Department of Environmental Conservation is also reviewing Cabot’s request for an amended permit that would allow the cheese-maker to stop spraying some fields and start spraying others in eight northern Vermont towns. The permit request has led to opposition from local activists. They’re concerned that Cabot’s long-standing practice of spraying waste water from its cheese plant onto farm fields could harm the environment. State officials say the process is safe. Still, it takes a lot of land to handle the effluent. Cabot has to clean its plant after every batch of cheese. And it doesn’t have any place to dispose of the waste water except to put it on farm fields. So the co-op sprays about 100,000 gallons a day. The co-op says it’s not expanding the total land area being used, just switching around locations. But opponents argue that Cabot uses a mix of cleaning chemicals that could pollute water, or even harm public health. Bram Towbin, a selectboard member from Plainfield, testified against the plan at a recent hearing of the House Fish, Wildlife and Water Resources Committee. "You don’t want your citizens to be guinea pigs should the standards change down the line," Towbin says. Towbin told the committee that Cabot and its parent the Agri-Mark dairy cooperative should find alternatives to spraying waste water on land. "It seems to me that the pressure needs to be applied to Agri-Mark to basically just say, ‘Look, we’re not comfortable with you guys spraying toxic stuff in any amount on the field,’" he says. "They’ve got a good deal for many years and they’re going to want to continue the process and I think somebody needs to put their feet to the fire." But state officials say the practice is actually a safe way to treat the waste water left over from cleaning the cheese-making equipment. John Akielaszek heads the Department of Environmental Conservation indirect discharge section. He told the committee that Cabot has been spraying fields since 1990, and the state has never found violations of water quality standards. He says a recent surprise inspection turned up no problems with the waste water. "I wouldn’t drink it, but it has levels that are, that would meet the groundwater protection rules primary standards," he says. "So what are we dealing with? We’re dealing with something that’s mostly water." The water does contain minute amounts of cleaning chemicals, which in high concentrations can be toxic. But those substances, Cabot and the state say, must meet Food and Drug Administration requirements for cleaning machinery used for food production. Akielaszek says sunlight and bacteria in the soil break down the trace chemicals. "The application rate is low that we don’t think there’s a lot getting through to the groundwater," he says. "We think it’s mostly absorbed mostly by vegetation or the soils themselves." The main problem facing the co-op is that the Cabot plant expanded in a place that’s no longer ideal for a food-processing facility that uses lots of water. The village of Cabot is located on the headwaters of the Winooski River. Ed Pcolar, Cabot’s senior vice president for operations, says the stream is simply too small to handle the quantity of effluent the plant produces. "The assimilative value assigned to the Winooski at that point will not allow for a waste treatment plant to be built," he says. Pcolar says the co-op has looked at other technologies, but he says spraying the waste water on the land remains the most effective method.